Imja Tsho, located at an altitude of 5,010 metres (16,437 feet), just 10 kilometres (6.2 miles) south of the world's highest peak, is the fastest-growing glacial lake in Nepal. "Draining the lake was on the priority of the government because of its high risk. We have successfully mitigated a disaster right now," Top Bahadur Khatri, the project manager of the Community Based Flood and Glacial Lake Outburst Risk Reduction Project, told AFP. "A 45-metres long tunnel was constructed to aid outflow of the lake downstream. We have also installed a mechanical gate to control the discharge," said Lieutenant Colonel Bharat Lal Shrestha, who led the army team. "Because of the wind, snow and thin air, we could work only two or three hours a day. It was a challenging task," he told AFP. "Our plan is to now replicate the work in other high-risk glacial lakes," Khatri said. 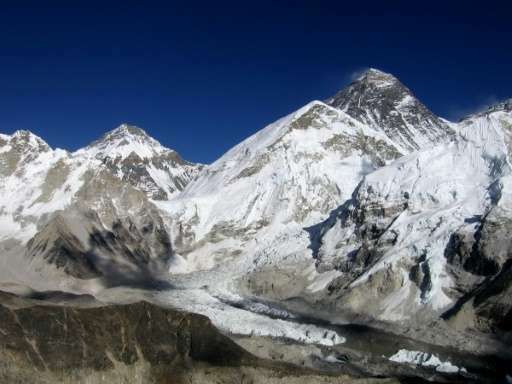 A study published by the Kathmandu-based International Centre for Integrated Mountain Development used satellite imagery to show how Nepal's glaciers had already shrunk by nearly a quarter between 1977 and 2010.